Planning your new deck means getting an education on the new materials and composites that have come on the market in the past few years. Visiting a Home Show or just doing your research online will help you get aquainted with all the newest options in decking and help you to make the right choice for your new deck. 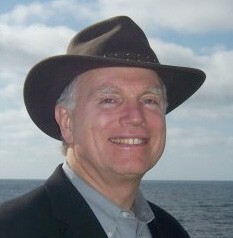 Weston Leavens, owner of Deckmaster Fine Decks. helped to change the entire industry when he invented and patented the Deckmaster Hidden Deck Fastener System some 25 years ago. Before then, all decking boards were simply nailed or screwed in, leaving holes for water to penetrate both the boards and the support beams, ultimately leading to the early demise of the deck. Weston changed all that by developing a system which he uses on every deck, securing each board from underneath, leaving a beautiful, long-lasting deck. You might be surprised by the number of material choices that are now available for outdoor decking, fencing and patio covers. Gone are the days when the choices were as simple as a couple types of natural wood. In low-maintenance deck materials, the terrain is constantly changing. Low-maintenance decking materials don’t require annual maintenance – ever. They are very easy to clean and most often can be cleaned with soap and water. These materials come with lifetime or 25-year or more warranties that protect against warping, cracking, cupping and more. Each company has a different warranty but across the board, the protection is fairly comprehensive and incredibly long. 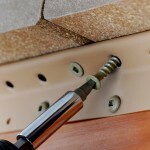 Capped composites also are warrantied against fade for the life of the product. Though the price is generally higher on the both composite and synthetic decking, it turns out that it’s about the same as premium wood (like Ipe or Batu), when you take into consideration the maintenance costs associated with wood decks. 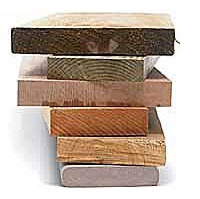 Generally speaking, a good composite or synthetic board will be 4-6 times more expensive than lower grade wood. Both composite decking and PVC decking is designed to stand up to the elements, allowing it to maintain its beauty for years. It’s important to understand the difference between composite, capped composite and synthetic decking material. 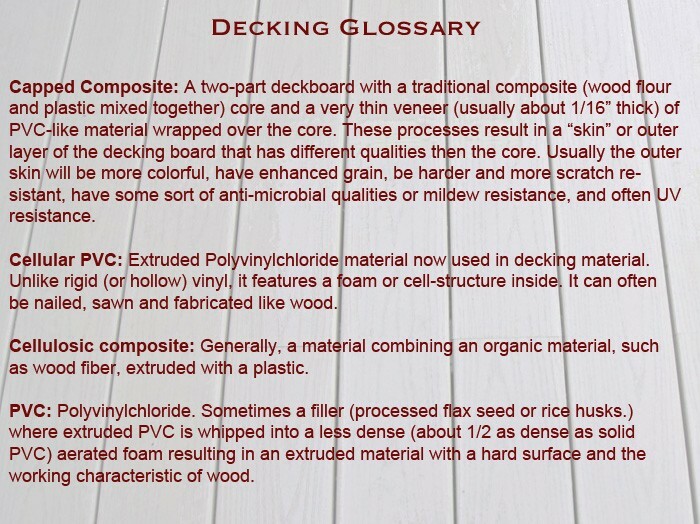 (See our Decking Glossary below, for more information). 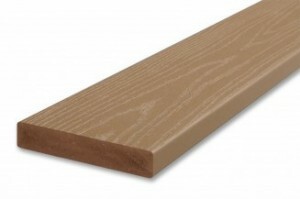 Specifically, composite decking or wood-plastic capped composites (like TimberTech’s Earthwood Evolutions) can be more prone to absorbing stains and scratching, but will not splinter. Azek decking is another scratch- and stain-resistant choice that is also moisture resistant – a good thing for our more damp areas of the County. Though Azek decking does come with a limited Lifetime Warranty and does not require a minimum height clearance off the ground, it can show mold or mildew on the surface only, which can be cleaned with a mixture of bleach and water. Not all capped-composite decking perform the same. 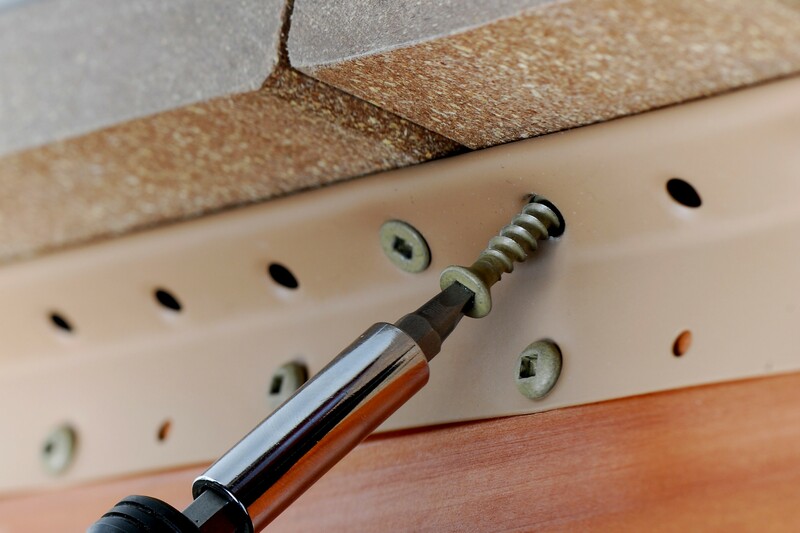 Make sure you know how the materials that you’re considering have preformed over the years. With cellular PVC decking (like TimberTech’s XLM), there is no need to paint, stain or seal it, which is often a burdensome yearly project with traditional wood decks. And, because it resists most weathering, warping, and bugs, you won’t find it necessary to replace rotting, uneven, or insect-damaged boards. Unlike many traditional wood decks, non-wood decks are splinter-free and slip-resistant, making your home a little safer for bare feet, small children and pets. PVC actually has better traction when wet than dry. Traditional wood decks can be beautiful but need regular maintenance to stay that way. Wet springs, blistering summers and damp winters (the likes of which we have almost everywhere in Sonoma County), quickly take their toll, leaving untreated wood decks faded, splintered and warped. 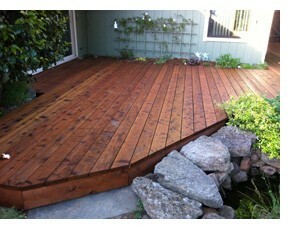 On the average, the lifespan of a redwood deck that has been well-maintained, is about 20 years. Wood-plastic composite decking and PVC decking are made from a process that is specifically designed for its use and results in consistent, low-maintenance decking performance with warranties you can count on. Increases Home Value – Low-maintenance decks not only add value to your lifestyle, they add value to your home. With a composite deck homeowners can recoup much of the investment when selling their home. Remodeling Magazine’s 2012 Cost vs. Value Report estimates a 62.8% return on investment for these type of deck additions on a national average. Low-maintenance decking manufacturers offer a variety of color choices – many that even emulate the look of traditional lumber or exotic hardwood. In addition, you can also find deck accessories ranging from railing, handrails, gates, and post caps to deck lighting, all designed to complete your outdoor living space and complement and enhance the beauty and safety of the deck. – Many people are surprised to hear that wood can be more expensive than composites in the long run. True, the initial cost of wood can be less, but when you add in the cost of on-going maintenance on a wood deck, including cleaning and sealing every 1-2 years, a low-maintenance deck can recoup it’s additional cost in as little as five years. More important, even if maintained well, some wood deck boards will be ready for replacement in less than 10 years. In the end, choosing low-maintenance decking vs. wood decking is a personal choice. 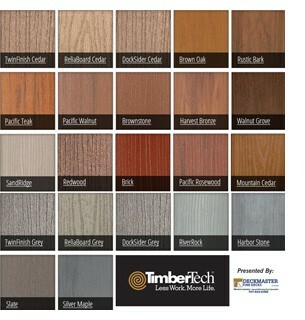 TimberTech and Azek are both top-rated composite/synthetic decking materials that we install. Both are low maintenance, safe, durable, and can even increase the value of your home. 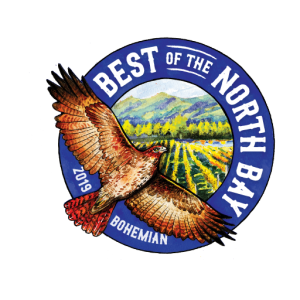 Both maintains their color and beauty for years without the work of painting, staining or sealing. And, because they resist mildew, warping and insects, there’s no need to replace rotting, uneven or termite-damaged boards. This saves time and money over the life of your deck and fence. TimberTech even offers a 25-year fade and stain warranty on some of its products – a commitment and benefit not available with many treated wood decks. Read more about TimberTech HERE. Cost – There are different types and grades of wood decks available. Softwoods (like redwood and cedar) can cost the least initially, however they’ll also require regular maintenance and generally have the shortest lifespan. There are exotic hardwoods like Ipe and Batu available that have a longer lifespan and are usually more expensive. 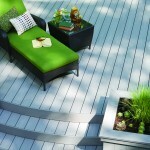 Non-wood decking costs often fall between those two wood options and have varied product choices that fit most budgets. So, while the upfront cost of a composite deck might be slightly higher than that of a traditional wood deck, the low maintenance benefits provide a lower overall cost for the lifetime of the deck. Deckmaster Fine Decks will help you decide on which type of decking meets your needs, both in look and budget. We’ll install whatever deck you like and help you design it. We bring over 30 years or design and building experience to every deck we build, repair or refurbish. Ask us how you can get the deck you’ve dreamt about – Right Now – with our Promotional Payment Options!